So much brighter! I love it! Fantastic job and WOW you're brave for taking out that wall. I would have been scared too! What a difference! I can see why you're in love with them. Absolutely love the treatment on the stair treads. Fabulous job! Thank you Debbie! Have a great day! Wow! Fabulous job! Love it. what a difference the railing & open spindles make ~ perfect! Oh how fun! I totally agree! Good luck on your renovations! And thanks for stopping by! tile in the pattern of a rug maybe? Wow...it looks beautiful!!! At first I looked at the before with the half wall and thought "what's wrong with that? ", but now that I see the after...so much better!! Absolutely amazing! What a vintage difference spindles make versus a half wall! As far as the plywood, I have seen where people painted the plywood with a pattern or stenciled a pattern on. I read John and Sherry's blog, Young House Love, and I believe they stenciled the plywood in one of their bathrooms. This project turned out beautifully...I've been wanting to re-do our stairs for a long time...I'm inspired! Wow! That looks so much better! Not sure I could have made that first cut. Did you put some of the spindles upside down on purpose? Sorry! Only someone as OCD as me would notice. Ten dollars....you are so flippin' amazing. Seriously. Love it. Nice job! I liked the updates that you did in the ‘before’ photo as well, but the ‘after’ looks so light and fresh with the mix of white and grey. I’ll have to keep that weathered grey finish in mind if we ever get around to upgrading our carpeted stairs (someday hopefully!). What a transformation! It lovely! You guys did a wonderful job. Personally, I couldn't even tell if any were upside down. I say, leave them that way. 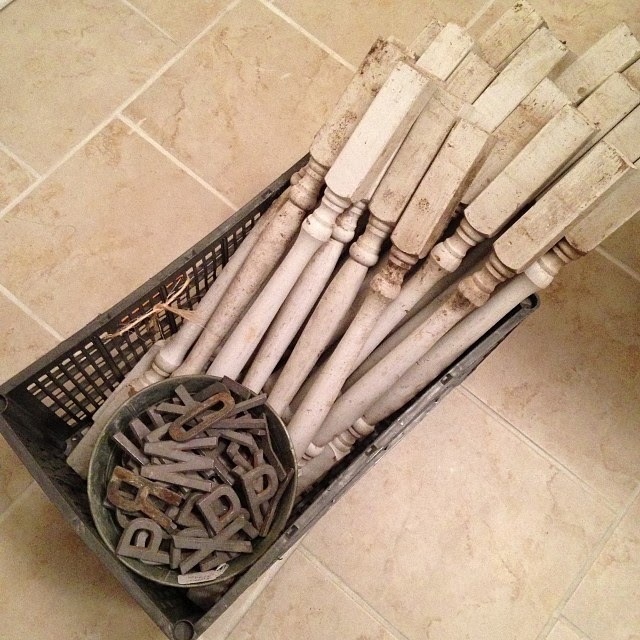 Part of the beauty of DIY and rustic things are the imperfections. Love all the colors too! What a great job! It really opens up the stairs to your room. In the are that doesn't have wood floors, you could pur a tile mosaic, or I loved the idea above of tiles in the shape of a rug. Are you not able to replace the hardwood flooring where the plywood went in? That would be my first attempt. Fantastic! It's so open and airy now. The stairs look great too! You two are incredibly creative and talented. Diana, You continue to provide inspiration for me! I love that you reuse when possible. thanks for sharing all your projects. how EXCITING! i love it! and i have no budget to do my upstairs hallway and master bedroom. so we took out the nasty carpet and i PAINTED the whole area (plywood sub-floor) high-gloss white! i LOVE it! i would do that at bottom of the stairs. easy to clean and you can repaint when you want! i'm going to go home and show my hubby what you've done with your 1/2 wall on stairway. we have a 1/2 wall between up and down stairs (tri-level)..i think we could do this! great job LOVE your blog!!! WOW! What a nice difference that makes! Just lovely! So happy you finally got your pretty railing! I love the after so much. Great work! I didn't notice the spindle issue and still can't see it. When quilters used to make quilts, they often made a mistake on purpose because only God is perfect. So leave them. My grandfather made four dining room chairs which I have and one has upside down spindles on the back. I love them that way! If matching the hardwood floor isn't in the budget, I love the idea of painting or stenciling the plywood. Or maybe you could make a floorcloth. I love the after picture. You did a great job! I didn't notice the spindle issue and even after I read about it, I couldn't see it. When quilters used to make quilts, they often made a mistake somewhere in the quilt because only God is perfect. So leave it. My grandfather made the four chairs I have in my dining room and one chair has upside down spindles on the back. I love them more because of that! If matching the hardwood boards isn't in the budget, I love the idea of painting or stenciling the plywood. Or maybe you could paint a floorcloth. What color paint is in your hallway? I really like your stairs now! Wow the after pictures are gorgeous...and love those spindles! As far as the plywood, I think throwing a rug over it for now would be just fine or get some cheap salvaged wood (that purposely doesn't match the rest of the floors) and make a border and fill it in to give it that "rug" look but out of wood. Wow!!! Well done. It looks perfect. Most old houses have hardwood in the closets. Our house was built in 1900 and most of the flooring runs under the walls throughout the house. You could consider pulling hardwood from the closet to work into the space, but it's not an easy job and would probably require sanding and staining the entire area. New wood probably wouldn't be the same dimensions. I think the DIY network has some instructions for mending wood floor. If not, you might check Nicole Curtis' website. She replaces sections of wood flooring in a lot of the houses she remodels. You can definitely do it yourself if you're brave and the tools can be rented a lot of the time. I would put the plywood and carpet in the closet to replace the wood you stole from there so that you don't have any added expense there. Good luck! I love the house! I didn't read through all the comments, so maybe it's already been mentioned, but could you possibly paint something on that section? Like black & white checkerboard, for example. We have red fir at the bottom of our 1922 stairs that runs right into oak floors. I've considered this very thing. And as always....you inspire me, and I admire you :). Oh, and have you watched The Rehab Addict? This totally reminds me of her show...and I want to be her...Hahahaha! Stairs look fantastic! I know you used Annie Sloan paint on the stairs. Have you ever used Annie Sloan paint on a piece of furniture? I just started painting my kitchen table, and it looks very streaky. I think it will require 3-4 coats. What has your experience been? If you haven't used Annie Sloan paint on furniture, is there a brand/process you would recommend? Stairs look fantastic!! Have you ever used Annie Sloan paint on furniture? I started painting by kitchen table, and it looks streaky. I think it will require 3-4 coats. If you've used other paint for furniture, is there a brand/process you would recommend? What a wonderful reno!! I am totally saving your photos if that's fine for future reference! Thanks for sharing this! I like this a lot and I'm ready to jump in and cut into my half wall now! STUNNING! I LOVE your home.... Perfect. Just perfect. Hi! We have the exact problem you had. Any chance you can provide more detail on how you handled the light switch? Thanks! I love your stairs. I'm In the process of updating my stairs, I have removed the carpet but I'm not sure yet what to do with the steps. Did you wax the steps after applying the Annie Sloan paint ? I love your stairs. I have removed the carpet on mine and I'm not sure what to do with the steps yet. Did you apply wax on the Annie Sloan paint ? Hi, I like both of your stair pics, the black board painted ones and the updated make over stairs also. I made the mistake of painting my stairs white. With just me using them they are still a mess. I love the AS chalk paint and am planning to use the same color as you did. I really like how they turned out and your technique. Can you tell me if you waxed them with the light and then a bit of dark wax next? Just wonder if they feel more slick with the wax? I hope you have a very Merry Christmas. Hello Diana, thank you so much for this inspirational project. I've a couple of contractors how can I open kinda similar wall at our stairs without ripping the whole stairs apart and all of them have told me that it's impossible... And when I saw your brave project, I was so amazed. You inspired me to do it on our own. But I do have a question - what was under the carpet? Was there playwood or wood? 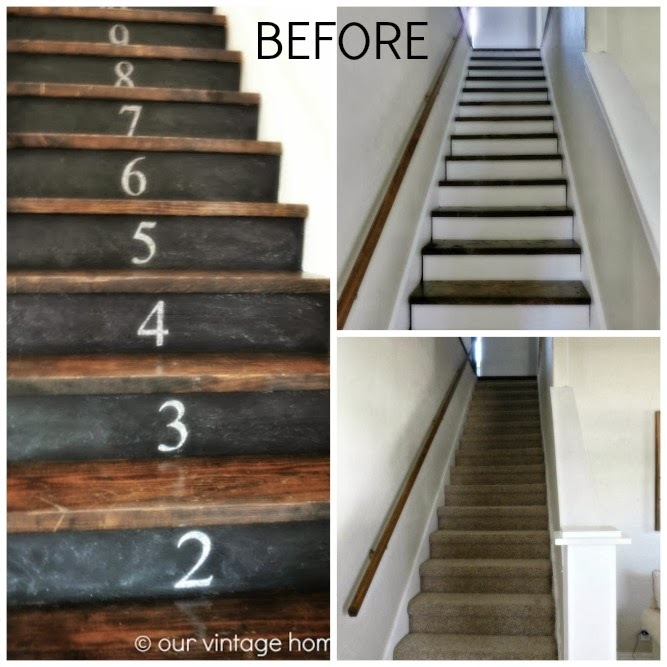 Did you put/change any flooring on top of the stairs, or you just painted what ever was under the carpet? Thank you.